On my second Emirates first class flight on this trip from Dubai to Singapore, I was the only passenger in first class. This flight departed at around 3am, and we were delayed a bit due to congestion. Funny how 3am is a congested time at DXB! Only in the Middle East. Based on the first interaction, I could immediately tell that Sarah, the flight attendant serving the first class cabin, was awesome. She was super bubbly and nice, and she was really attentive. I wanted to go to sleep immediately, so I almost felt bad that I wasn’t giving her anything to do. I told her that I wanted lots of water, the cabin temperature lowered, and to be woken up 1 hour and 45 minutes prior to landing so I could take a shower and have a meal. She set up a bed in another suite and delivered my requested water. I slept soundly for a couple of hours, and I didn’t overheat thanks to the lowered cabin temperature. I was woken up exactly 1 hour and 45 minutes prior to departure. After waking up, I showered, which is such a great (if excessive) amenity. I felt super refreshed and was able to hit the ground running in Singapore thanks to my onboard shower. For this flight, I had pre-ordered a vegetarian oriental special meal (VOML). Even though I was the only passenger and I had pre-ordered a special meal, Sarah told me that the entire menu was catered as well, so she guilted me into trying the vegetarian pad thai from the menu as well as my special meal. It’s hard to see, but I enjoyed the pain au chocolat that was in the bread basket. The vegetarian pad thai, on the other hand, was not very good. It just tasted salty and a little bit spicy, kinda like a bad chow mein. Not at all like what pad thai should taste like. My VOML was actually pretty decent. It was vegetarian dim sum, although it looked a lot like meat to me. There were some stir-fried noodles, sticky rice in a banana leaf, and shu mai. Finally, I had a fruit plate for dessert. This crew was generally much more detail oriented than other Emirates crews I’ve had in the past. They did things like tidy up my seat while I was in the bathroom, which I’ve generally found to be more common on Asian carriers (e.g. Singapore, Cathay Pacific, ANA) than other ones. Easily the best Emirates crew I’ve had. Overall, this was a great flight. People sometimes criticize Middle Eastern carriers for having service that lacks personality and attention to detail, but Sarah on this flight was amazing, and she provided service that could rival the service I’ve received on any other airline. I just wish I were awake for more of the flight to experience more of the service! This entry was posted in Emirates, Travel, Trip Reports and tagged a380, emirates, first class, flight review, travel, trip report, voml on July 13, 2016 by Edward. On this trip, I also decided to check out the business class lounge at Dubai. The quick summary is that the business class lounge is like a slightly-less nice version of the first class lounge. It offers nearly identical amenities, but just a little less nice. The business center has cubicles in it, instead of being open air like the first class lounge. I imagine that the cubicles are helpful for some privacy since the business class lounge was considerably busier than the first class lounge. 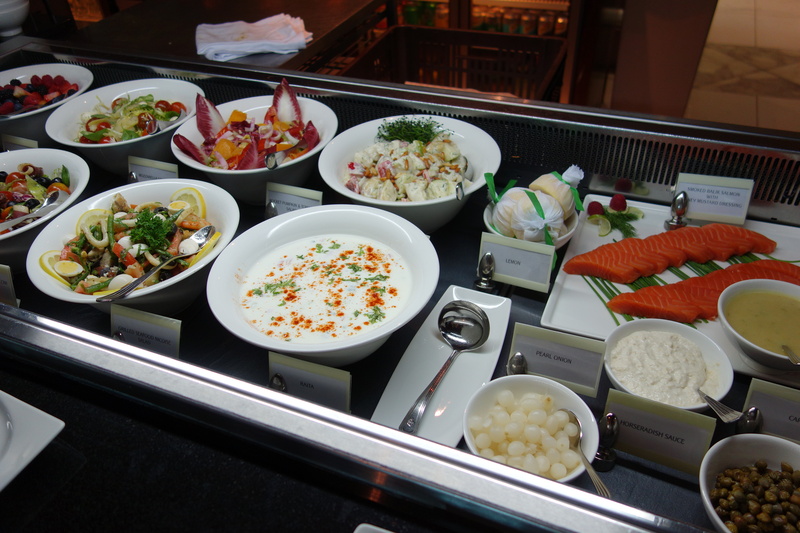 The business class lounge buffet has slightly fewer food options than the first class lounge, but it’s still quite extensive, and many of the food choices are the same. There’s unfortunately no made-to-order menu, though. There’s also a kids room in the business class lounge. One example of being slightly less nice is that the kids room in the business class lounge had a PS3 to play, while the kids room in the first class lounge had a PS4 (I didn’t even realize this was a thing, which shows you how behind the times I am). There’s no dedicated relaxation room in the business class lounge, but there are reclining chairs scattered throughout the lounge with blankets on them. One thing that I appreciated about the business class lounge were that there seemed to be lots of hidden seating areas. So you might be able to find a small, cozier section to have to yourself. If you go to the far ends of the lounges, you can go downstairs to the “quiet lounge” areas where there are donuts. I don’t think that many people make it that far as the lounge attendant working in that area seemed quite surprised to see me there. Overall, the business class lounge is just like a slightly less nice version of the first class lounge. The lounge offers all of the amenities you might expect from a business class lounge, and there’s plenty of space and seating, even though there are more passengers. If you’re looking for a quiet place, I’d say try going to the far ends of the lounge, since the lounge is so big that most people probably don’t explore the whole thing. This entry was posted in Emirates, Lounge Reviews, Travel, Trip Reports and tagged airport lounge, business class, dxb, emirates, lounge review, travel, trip report on July 12, 2016 by Edward. 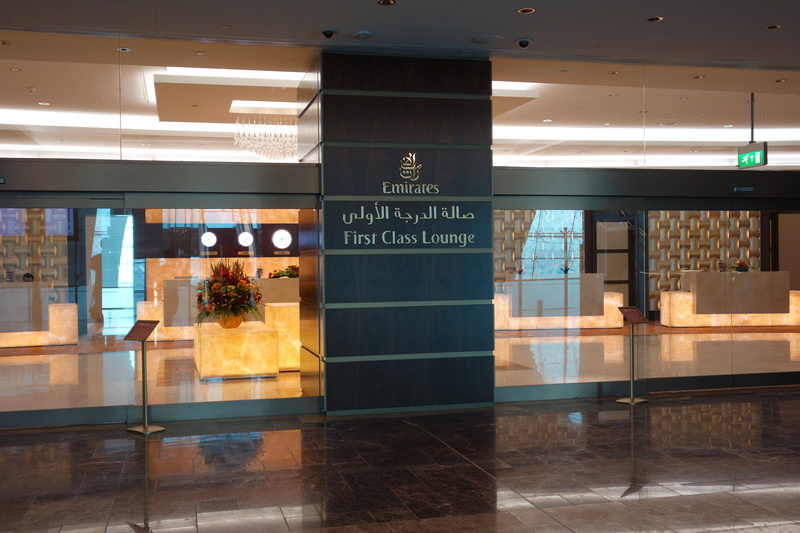 I’ve reviewed the Emirates First Class Lounge at Dubai before, but that was in 2013, so here’s an updated review. The entrance to the spa is right in front of the entrance to the first class lounge. As a First Class passenger, you’re entitled to a complimentary treatment. This time, I chose a haircut since I never seem to get haircuts as often as I should, and it was pretty decent (although my hair is very simple and unstyled). I can’t help but be impressed whenever I visit this lounge. It’s huge. Cavernous, almost. It’s also a bit sterile, in that it doesn’t feel “cozy” at all, and the first class lounge is strange in that it’s often only very sparsely populated with passengers, and yet there are tons of staff just standing around with nothing to do. The lounge has just about every sort of lounge amenity that you could think of. There are video games, TVs, a business center, a formal dining room, a more casual cafe-ish dining area, shower rooms, a spa, shopping, a kids room, a cigar room, a prayer room, a relaxation room, and a shoe shine stand. I spent some time working in the business center. One thing that could be improved is the wifi speed. The wifi is pretty slow (about 1 mbps down), but it works. Although I didn’t use it this time around, I’ve taken a nap in the relaxation room before, and it’s plenty comfortable for that purpose. They have pillows and blankets and eye masks at all of the seats. Not a place you’d want to spend too much time given the lack of privacy, but fine if you need a place to lie down for a bit. One nice aspect of this lounge is the dining area with proper table service. There’s both an extensive menu as well as an extensive buffet for whatever you’re looking for. Here are photos of the made-to-order menu at the time. Apologies for the hand and camera shadows! I decided to order some food from the menu. To start, they brought out some mezze and some bread and butter. More airlines should serve good bread and butter. Good bread isn’t that expensive, and it’s super good. I think the best bread I’ve had on airlines has been on either JAL or Qantas, and I appreciated the bread and butter served in the lounge here. Next up I had the spring roll. Which was a spring roll. Not too much to say about it. For me entree, I had the paneer achari, which was pretty good. A solid vegetarian main, although I wish they had more vegetarian options on the menu. For dessert, I just had a large bowl of berries. Berries are so great and can be rare to find while traveling! Overall, the Emirates First Class lounge at DXB is just an impressive physical space. The lounge spans the length of much of the terminal, and you can board directly from the lounge onto A380s. The lounge offers all of the amenities that you might expect from a lounge, and generally does a good job with all of them. The service can be a bit strange given the extreme surplus of workers to passengers (you’d think that would mean that the service would be extremely attentive, but I haven’t found that to be the case), but it’s definitely a treat every time I get to visit this lounge. This entry was posted in Emirates, Lounge Reviews, Travel, Trip Reports and tagged airport lounge, dxb, emirates, first class, lounge review, travel, trip report on July 12, 2016 by Edward. 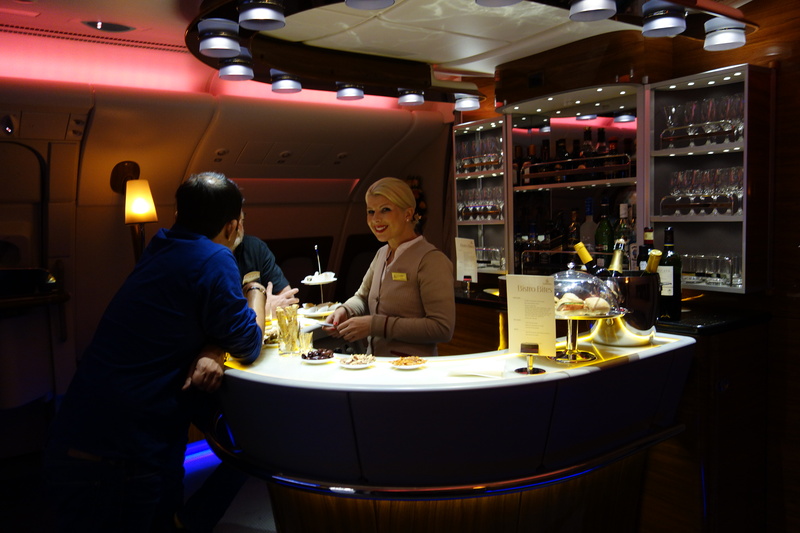 This was my second flight in Emirates Airlines First Class on their A380. Emirates was actually the first airline that I ever flew in international first class, so it has a special place in my heart. Boarding was a bit delayed due to a late-arriving aircraft, but I was welcomed warmly on board once boarding started. There were only two passengers in first class on this flight, so I was shown to my assigned suite and told I could sit anywhere. This was a newer aircraft (just two months old), and it’s an impressive hard product. The suite has tons of storage space, including a closet for each seat (although it’s not actually an enclosed closet and just opens up into your suite). It feels extremely private, and I love the finishes. 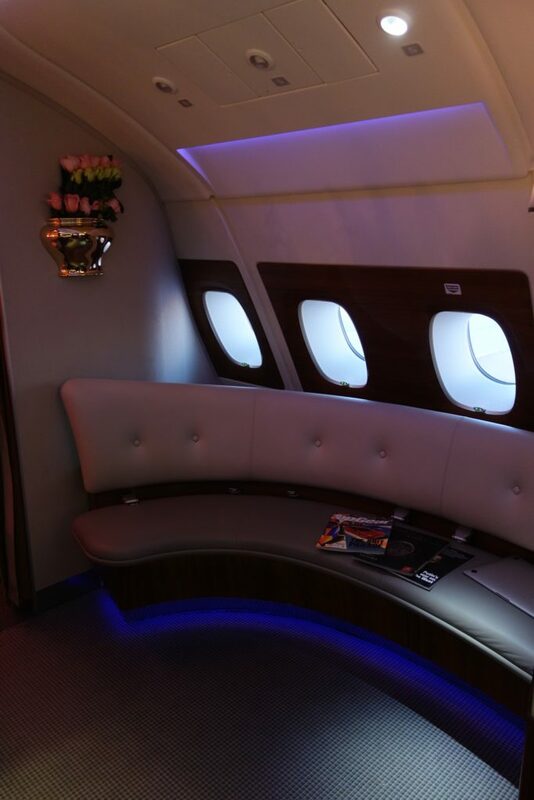 The only critique is that the seat itself is actually not that wide, and the cabin feels a bit crowded to me when all of the doors are closed, but that’s a function of having enclosed suites rather than open seats. 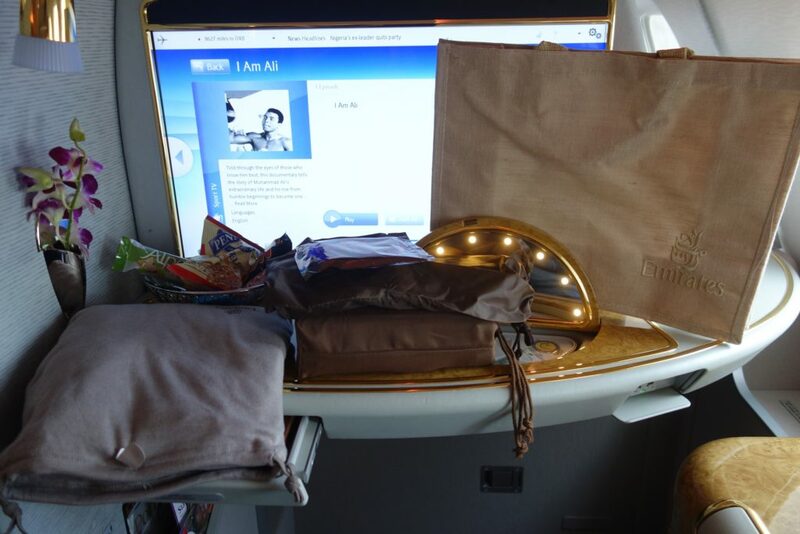 I was quickly offered amenities of pajamas, slippers, an amenity kit, a snack basket, and a bag to hold it all. Already at the seat was a writing kit (I’m a fan of the pen), a vanity kit, headphones, and a stocked drink mini-bar. Multiple people came by to greet me before the flight, and I was given a tour of the bathrooms and seat functions. And then the captain came by and offered me a chance to look at the cockpit, which was awesome! I was also told that the load was super light in all classes, with just 261 passengers and 31 crew. Prior to departure, I was offered Arabic coffee and dates as well as the opportunity to order a pre-departure beverage. I asked for sparking water with lime or lemon, and when I was asked if I wanted ice, I said no if the water was chilled. When I was brought the water, the flight attendant wanted to make sure that the water was cold enough for me! She was super on point. This plane had the option to watch not just from a tail camera, but also a downward-facing camera as well as one at the nose of the plane, which was awesome! I love the takeoff roll on the A380 because you’re off the ground before you feel like the plane is even moving quickly. After takeoff, I had the chance to peruse the massive menus. Emirates has an on-demand dining service, and I had pre-ordered an Asian vegetarian special meal (AVML). I decided to hold off on eating a proper meal given that I had eaten quite a bit in the lounge at SFO prior to the flight, so I just had some fruit to start. At the time, Emirates was offering 10 megabytes of free wifi to all passengers, and an additional 500 megabytes was $1. I paid for extra data, but the wifi was slooooow. I could check email, but only intermittently. I spent a while at the bar behind the business class cabin and had some good conversation with a senior flight steward. As much as I love the A380 as a (first class) passenger, he said that the A380 has a reputation for being crew-unfriendly (e.g. not enough galley space or ovens, smaller crew rest space compared to a 777). I was the only passenger who even passed through the bar for the couple of hours I was there, but the bar area apparently gets used much more on other flights. For my main meal, I started off with some caviar. I was served a generous portion of caviar with all of the normal accoutrements including egg, sour cream, blinis, toast, onions, and lemon. Next up was the appetizer of my special meal. This was a cold chickpea and jicama salad. This was pretty bland and not that appetizing. For the entree, I was served some daal and paneer with rice. This was quite tasty! Even though it doesn’t seem like “first class” food, I ate it happily and enjoyed it quite a bit. After the meal service, I had a bed made up in a different seat (a perk of being in an almost-empty cabin). To be honest, the bed is not as comfortable for me as other first class seats like Cathay Pacific or Lufthansa. The mattress pad isn’t that thick, so you can feel bumps in the seat, and the seat doesn’t seem to actually go lie flat (although I don’t mind the non-lie-flatness part that much since there’s a natural backwards tilt when you’re in a plane). After sleeping for a bit, I decided to have my shower in the air. This is just such a ridiculous and excessive experience, although it does make me feel like I’m ready to go immediately after getting off a long flight. These bathrooms on the A380 are nicer than my bathroom at home. 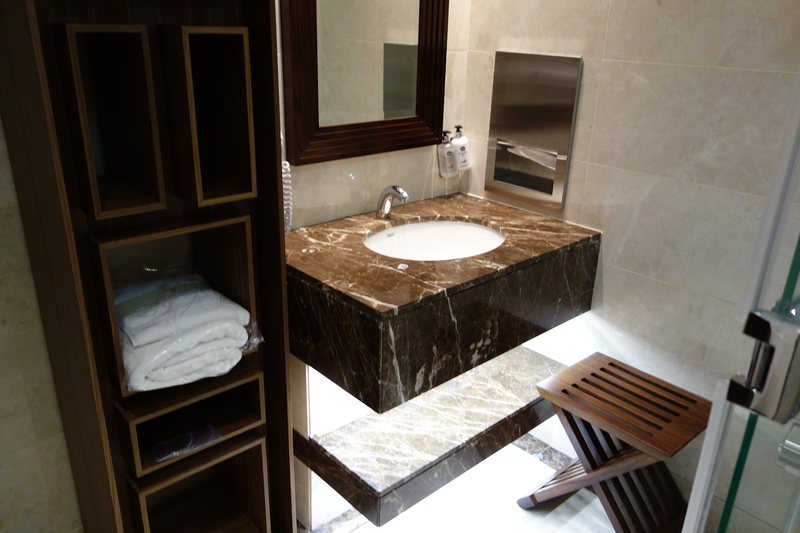 They’re super spacious with heated floors, lots of mirrors and counter space, and even a screen! They have two choices for toiletries (relax or revive), shaving kits, nail files, loofahs, a hair dryer, etc. As an aside, I will say that I feel a bit bad for the dedicated bathroom attendants. There are two of them on A380 flights, and it seems like some members of the flight crew treat them pretty poorly. Finally, as a pre-arrival meal, I was served some rice with a spicy pea curry and a samosa. All of it was again pretty tasty. 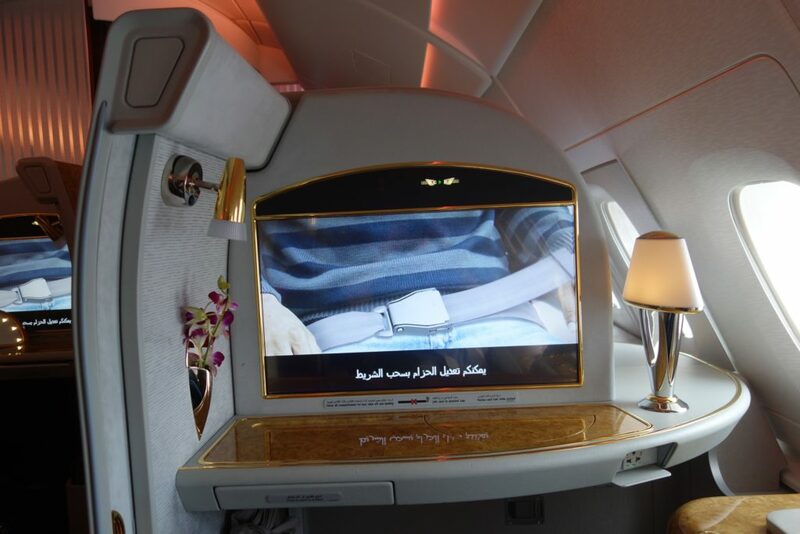 Overall, Emirates has a pretty special hard product in first class on their A380s. They were the first to let you shower on board, which is a ridiculous experience. The seats are super private, and the in-flight entertainment system is the my favorite of any airline. I also think that the bar area is pretty cool. As for the soft product, the service on this flight was generally good. There were a couple of minor issues, but the flight attendants were responsive to any requests that I made. There are also tons of options for food and beverages, and the AVML I had on this flight was pretty good. 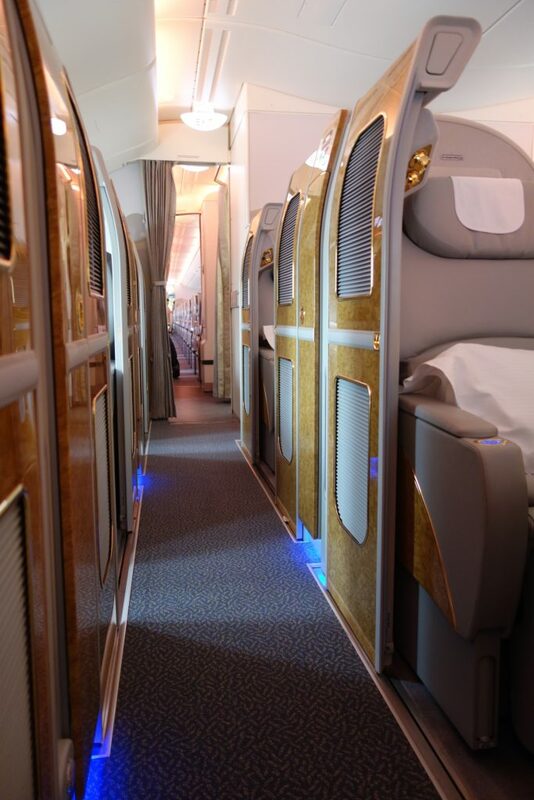 This entry was posted in Emirates, Travel, Trip Reports and tagged a380, avml, emirates, first class, flight review, travel, trip report on July 11, 2016 by Edward. This next trip from the depths of my photo archives occurred in February 2015. I had a wedding to go to in Jakarta, so I decided to make a pit stop in Singapore–one of my favorite food cities in the world–on the way there. To get to Singapore, I flew Emirates first class, booked with 100k Alaska miles (this award would now be 180k miles). When you fly Emirates in business class or first class cabin, you get a complimentary chauffeur service to the airport–that is, if you’re booked through Emirates or Qantas ticket stock. It was just a couple of weeks before my flight that Emirates announced that tickets issued through partners would not be eligible for the complimentary chauffeur service, but I was lucky in that my pre-booked chauffeur service was not retroactively canceled on me. This was what I had waiting outside of my office for me on the day of departure. It was a relatively quick drive to the airport, and then I was off to the Emirates Lounge at SFO. 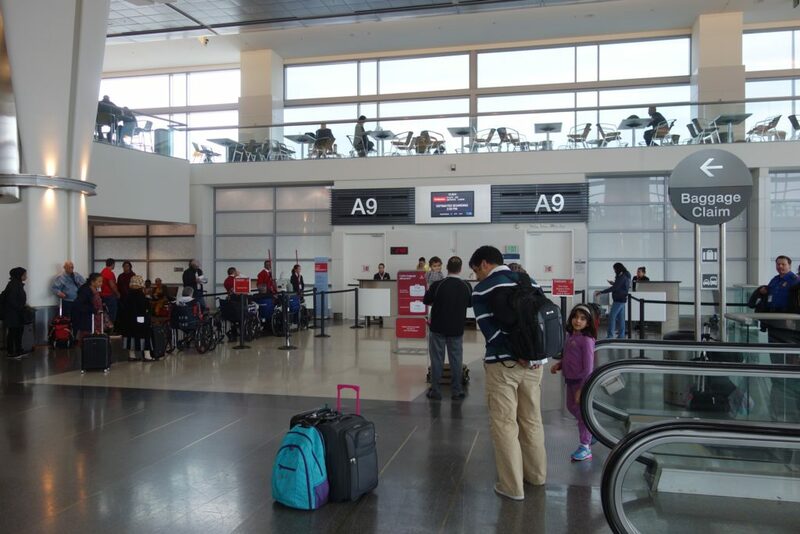 The lounge is located a level down from the main concourse in Terminal A, and first and business class passengers share this lounge. I was honestly very pleasantly surprised by this lounge, and I think it’s the best lounge I’ve been to at SFO (other lounges I’ve visited at SFO: the Cathay Pacific lounge, Amex Centurion lounge, United Club, and American Admirals Club). It’s perhaps not as stylish as the Amex Centurion lounge, but it’s much less crowded and has more extensive food options. Upon entering the lounge, I was happy to see large windows overlooking the apron and lots of seating. There’s a business center and showers to the left of the entrance, but most of the seating and the food is to the right. This sounds silly, but one thing I was impressed by was all of the plants everywhere. There were just so many plants scattered throughout the lounge. And given that Emirates only has one flight a day (granted, it’s an A380, but it’s still only one flight), it’s even more impressive (excessive?) that they have such a nice lounge with all of these plants. There are a variety of self-serve drinks on offer, including Veuve Clicquot champagne. The food options in this lounge are also extremely extensive. When I visited, here’s a sample of the foods on offer: green pea panna cotta, chocolate creme brulee, grilled tuna, king prawns and squid, strawberry tarts, Arabic mezze, cheeses, palak paneer, Indian curry, penne pasta, potato gruyere gratin, chicken in tomato sauce, grilled beef filets, poached pacific salmon, lobster and potato cakes, green beans, and zucchini soup. The food isn’t award-winning, but I was more than happy to eat it. I also appreciated the variety of vegetarian options (assuming you like Indian food), and the creme brulee was delicious. My minor quibbles with the lounge were the relatively slow wifi (I was only getting 1 Mbps down), and there didn’t seem to be enough power outlets. But as I said before, I think this is my favorite lounge at SFO. The lounge never got too crowded, it’s a pleasant space to relax in, and the food options are both good and extensive. Overall, I was extremely impressed with this lounge. This entry was posted in Emirates, Lounge Reviews, Travel, Trip Reports and tagged airport lounge, business class, emirates, lounge review, sfo, travel, trip report on July 11, 2016 by Edward. I’m currently sitting in the Emirates SFO Lounge (an impressive lounge and definitely the nicest lounge at SFO that I’ve been to), and I got here via Emirates Chauffeur Drive, even though my ticket was booked via Alaska miles. It was a bit of a surprise when Emirates announced earlier this year that partner award bookings would no longer be eligible for Chauffeur Drive, and then they went through and seemingly canceled people’s Chauffeur Drive bookings that had already been made. A couple of weeks ago, it looked like those Chauffeur Drive bookings had been reinstated, and I’m happy to report that I did get a free car sent to pick me up and take me to SFO. Unfortunately, if you can’t make new Chauffeur Drive bookings or change existing Chauffeur Drive bookings, so it sounds like provided you made your booking before January 11, 2015, you’re good to go, but otherwise, you’re out of luck. Note that if you change your ticket, you will no longer have Chauffeur Drive, and you can’t make changes to your existing booking. A bit of good news for those who were sitting on tickets booked a while back! This entry was posted in Alaska, Emirates and tagged alaska, award travel, chauffeur drive, emirates on February 17, 2015 by Edward. Emirates Chauffeur Drive Back for Some Alaska Awards? I’m writing about this only because I have an Alaska Airlines redemption on Emirates First Class planned in a couple of weeks, but Emirates Chauffeur Drive appears to be back for Alaska awards ticketed before January 11, 2015. Lucky wrote that Chauffeur Drive was going to be limited to tickets issued on Emirates and Qantas ticket stock, which means that Alaska award redemptions wouldn’t qualify. In addition, he posted that previously booked cars would not be honored. Bad luck for someone like me who booked last year for a trip later this month (I also missed out on Qantas Chauffeur Drive when they decided to stop it for award tickets in North America after I already had a first class award booked). But I’m happy to report that my Chauffeur Drive is visible under Manage My Booking on the Emirates website and that Emirates seems to have backpedaled a bit and reinstated Chauffeur Drive for those people who booked before January 11, 2015. The website might be a little wonky if you need to change/confirm your booking, so you can try calling instead at 1-800-777-3999. This entry was posted in Emirates and tagged chauffeur drive, emirates on February 7, 2015 by Edward. Alaska Airlines has an interesting award program, largely because they’re not a part of any alliance and instead have one-off partnerships with a number of carriers. Two of those partners include Delta and American, so Alaska is often cited as a good program to credit to if you’re not particularly loyal to one carrier as you can credit Delta, American, and Alaska flights to Alaska. As I’ve argued before, the marginal value of a mile can vary wildly depending on how many miles you currently have in your accounts, so it often makes sense to concentrate your mileage earning if you don’t fly a lot. I currently have about 85,000 Alaska miles. I originally started collecting Alaska miles to redeem for Qantas first class, since Alaska used to be able to book Qantas awards at the same time as Qantas’s own members, which means it was slightly less of a crapshoot to find first class award seats, but that functionality has since been discontinued. This is still a possibility, but you can’t really plan around finding Qantas first class award seats, and now there’s not much of a reason to use Alaska miles for this over American miles (although Alaska charges 70k miles for a one-way first class seat while American charges 72.5k and the stopover rules are slightly different). Then there’s the oft-talked-about-but-rarely-booked (at least as far as I can tell) Alaska award of Cathay Pacific first class from North America to Africa for 70k miles one way. This is two lengthy flights in Cathay Pacific first class–from North America to Hong Kong, then Hong Kong to Johannesburg (Cathay’s only destination in Africa)–for the price of one. South Africa is one of my favorite places to visit, so this is definitely a possibility, and 70k miles is much cheaper and a more viable alternative than 100k miles on American for first class to Africa where you’re probably paying through the nose for first class flights on British Airways or 75k miles on United for first class where the best option is waiting 15 days in advance for Lufthansa to open up award availability. But the real reason why I applied for another Alaska Airlines credit card was to get enough miles to cross the 100k mile mark on Alaska, which gives you the opportunity to book Emirates first class to anywhere in the world. Alaska is the only US-based frequent flyer program to allow you to redeem for Emirates, and even though 100k miles is pricey for a one-way trip, this is probably the best way to experience Emirates first class (your alternative being JAL’s mileage program, which has a distance-based award chart and could thus be cheaper, but the most practical way of accumulating JAL miles is to transfer from SPG, which isn’t that practical for those of us who don’t spend much money). Which of these redemptions do you think is most worth it? I’ve had the fortune of already flying Emirates first class on the A380 (and experiencing the Emirates first class lounge/terminal in Dubai), and I’ve got a trip planned on Cathay Pacific first class for February, so Qantas is the only one of these I haven’t done. Should I hold out to see if I can snag Qantas space at some point? This entry was posted in Alaska, Awards, Cathay Pacific, Emirates, Qantas, Travel and tagged alaska, awards, cathay pacific, emirates, qantas on October 14, 2013 by Edward. One great thing about the First Class Lounge is that there are gates in the lounge, so again, there’s no need to interact with the riffraff to get onto the plane. This was my first time on an A380, and it’s quite a marvel. The plane is enormous, and they were using three corridors to board everyone on time. Similar to the First Class Lounge, my first impressions were that of excess. The suites are enormous, there’s a minibar at every seat, the screen is the largest I’ve ever seen, and they even have a vanity mirror. Funnily enough, the cabin itself felt a little claustrophobic to me, especially when people had their suite doors closed, but that’s just a natural consequence of having giant, extremely private suites. When your doors are closed, you’re in your own world because the walls are so high, but it also makes the aisles feel crowded. I had a lot of fun playing around with everything in the suite: there are multiple light sources, including a lamp next to the entertainment screen; the minibar is motorized and goes up and down; the in-flight entertainment and seat are controlled by a removable handheld touchscreen device, and there are multiple massage options. The flight attendants also went around introducing themselves to everyone and offered numerous amenities, including incredibly soft pajamas, slippers, eye shades, a large amenity kit, and a bag to hold everything in since they give you so much stuff. And of course, I spent a lot of time in the bathroom. The bathrooms are enormous: each bathroom is larger than the bathroom in my apartment in San Francisco. The bathrooms are well-stocked with toiletries, and they have a little pyramid of towels you can use to dry your hands, which is mostly just for show since they have a dedicated bathroom attendant that will replace the used towels so each time you enter the bathroom, the towel pyramid is once again intact. Shortly after takeoff, a flight attendant asked if I wanted to take a shower, and of course I said yes, even though I had just showered in the lounge. When it was time for me to shower, the flight attendant escorted me to the bathroom and explained everything in the bathroom to me–not just the shower–down to how to flush the toilet. She was quite thorough. When explaining the shower itself to me, she noticed that the flooring of the shower moved slightly, so there was an awkward interaction where she asked the bathroom attendant to tell the purser about it since the flight attendant was worried about passenger safety, but it was more like a power struggle since the bathroom attendant didn’t seem to like the flight attendant and just sort of ignored her, which led to a passive aggressive exchange. In my mind, I was just like, “I don’t care about safety! I just want my shower on a plane!”, and eventually, I was able to convince everyone that it was okay and that I was a strong, young man who can keep his balance in the shower in spite of a moving floor, but not before I was trapped in the bathroom with a flight attendant, bathroom attendant, and purser for several minutes. Anyway, the shower was amazing. You only get 5 minutes of water (but the flight attendant said that I could request more, likely because most passengers weren’t taking showers), but I honestly didn’t need even that since you can turn the water on and off. It was honestly a better shower than I’ve gotten in some hotels (and definitely better than most airport lounges) since the shower was super clean, the toiletries were awesome (they even had special scrubs), and the water pressure and temperature were good. And then I got to change into the super soft pajamas and blow dry my hair. On an airplane. Since the flight was a red-eye flight, most passengers just slept the whole way. I was slightly surprised by the fact that the cabin was completely full and that no one except for my friend and me seemed that excited to be flying in Emirates First Class on the A380. You can shower! In the sky! This seemed lost on all of the business travelers. This also meant that there wasn’t a full meal service, and the on-demand dining options weren’t as extensive as I would’ve expected from Emirates, but the drink options were as ridiculous as one might expect. I wasn’t very hungry after having feasted in the lounge, so I just opted for some lighter fare. The food was generally good, although I was a little surprised that the fruit wasn’t that ripe. After eating, I decided to nap for a little bit. The seat converts to a fully flat bed, and it’s quite spacious. Lots of room to roll around and do whatever. And since you can close the door completely, you don’t have to feel self-conscious about drooling/curling up in a fetal position/masturbating. I’m actually curious if flight attendants have to deal with that. I intentionally didn’t sleep for long as I was trying to readjust to San Francisco time, so I then spent some time exploring the plane. At the front of the first class cabin between the bathrooms, there’s an extensive self-serve bar stocked with very high quality alcohols. There’s also a larger bar in the very back of the upper deck which serves both business and first class that’s meant to be a social area. There weren’t very many people there given that it was a red eye, but it was a nice area to visit. There was another flight attendant who was extremely friendly and offered to take pictures of me behind the bar and gave me a picture souvenir using a Polaroid camera. When I got back to my seat, I of course had to use the call button at least once. Mostly because they label the call button as calling “room service”. A flight attendant was quick to attend to me within 5 seconds of my hitting the button. I spent the rest of the flight using ICE, Emirates’ in-flight entertainment system. They have a vast selection and overall one of the best in-flight entertainment systems I’ve ever used. 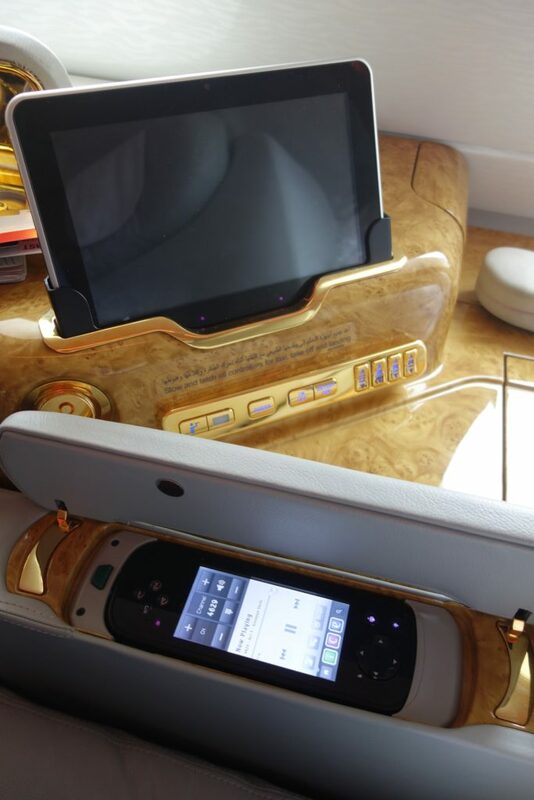 Flying Emirates First Class in the A380 is one of the most extravagant experiences I can imagine. You could actually live on one of these planes, given the showers and amount of space they devote to each first class passenger. This, along with the First Class Lounge in Dubai, should go on the bucket list of any serious miles aficionado. This entry was posted in Emirates, Travel, Trip Reports and tagged emirates, travel, trip report on June 17, 2013 by Edward. The Emirates First Class Lounge in Dubai is one of the most ridiculous things that I’ve ever experienced in my life. We arrived in Dubai at Terminal 1, and we decided to head to the lounge first before heading out into the city since we had a very long layover. So we made the very long trek to Terminal 3, which is technically accessible by walking. I’m not sure if we ever made it to Terminal 3, since we wound up finding a First Class Lounge that wasn’t the lounge that we wound up in later. But not knowing this at the time, we were still astounded by the size of the lounge, the services offered, and the multitude of people just waiting to serve someone. There were maybe fewer than 10 passengers in the lounge at the time, so there were absolutely no problems finding seating or flagging someone down to bring you something. Before heading out into the city, we decided to sample some of the many food offerings. The sheer number of things offered in the buffet was pretty incredible. It ranged from sushi to Balik salmon to Arabic food to a giant round of parmesan. They also offered a full menu of foods to order. After grabbing some food, we headed out to the city since our continuing flight wasn’t until late at night. This involved going the wrong way through a security checkpoint, walking outside on the tarmac briefly, worrying that we might get arrested, and eventually finding our way to the arrivals exit. Upon arrival back at the airport, we ended up going through the first class check-in for Terminal 3. It’s an unnecessarily large check-in hall and a long walk to actually get into the terminal. Once in the terminal, we again made our way to what we thought was the First Class Lounge. The real first class lounge? After entering the lounge and walking around, we started getting really confused. Since the lounge we had been in earlier was so large, we thought we had to be in the same lounge as this morning. Things looked pretty similar as well, so we just thought that we were maybe in a different section of the same lounge. But then we realized that we were in a completely new lounge. And this one was even more massive than the one we had been in earlier. This lounge spanned the entirety of the terminal, complete with its own duty free shops. At this point, we just started laughing. Emirates has at least two giant lounges in Dubai, this one having multiple duty free shops, multiple dining areas, multiple shower rooms, etc. We couldn’t believe that they would devote so much space to first class passengers, but it was true. And this time around, we were actually the only two passengers in the entire lounge. So essentially, it was like we had an entire airport terminal to ourselves. Of course we had to take advantage of the service and ate a five-course meal. If this were a restaurant, the meal would’ve easily cost at least $100 a head just due to service, especially since we had our own personal waiter who doted on us, and the ingredients were generally of high quality. Some things were quite good, including the soup, salmon, and desserts. But the burger was cooked well done even though I specifically told them to err on the rare side of medium rare and that I wouldn’t hold it against them if my burger were a little bloody. Then again, I don’t think I’ve ever had a proper burger outside of the US. After dinner, there was more time to explore the lounge, including the shower rooms, relaxation room, and game room. Overall, the lounge is somewhere I could easily live, even if there aren’t proper beds. The lounge is so big that it feels empty even at its most crowded. Good food and drinks abound, and there are people waiting at every corner to serve you. Any special requests that I had were quickly addressed (including asking for a non-dairy fruit smoothie with no tropical fruits), and service was impeccable. Everyone talks a lot about Emirates First Class for the shower in the A380, but I think the First Class Lounge is something that should also not be missed. This entry was posted in Emirates, Lounge Reviews, Travel, Trip Reports and tagged airport lounge, emirates, travel, trip report on June 14, 2013 by Edward.